MedShell - Protect Your EpiPen Auto-Injector from hot and cold temperatures, wherever you go. Protect Your EpiPen® Auto-Injector from hot and cold temperatures, wherever you go. How can you take your EpiPen® Auto-Injector outside and keep your EpiPen® Auto-Injector at about room temperature? If you’re like most people, there are times when you need to take your EpiPen® Auto-Injector to places that are not room temperature. MedShell enables your EpiPen® Auto-Injector to go where you go, even if it’s hot or cold outside. After I almost lost my son to a severe allergic reaction, I became determined to keep an EpiPen® Auto-Injector with my son wherever he goes. The problem is that EpiPen® Auto-Injectors need to be stored at about room temperature. ** My son regularly goes outside, so how could I follow the doctor’s advice to make sure my son always has an EpiPen® Auto-Injector and follow the manufacturer’s advice to keep the EpiPen® Auto-Injector at about room temperature? We are driven by the goal of saving lives by enabling people to take their EpiPen® Auto-Injectors wherever they go, even if it’s hot or cold outside. * MedShell can help shield your EpiPen Auto-Injector from hot and cold outdoor temperatures, but the internal temperature of MedShell will deviate from room temperature depending on the harshness of the outdoor temperature and the amount of time MedShell is located in the harsh temperature. 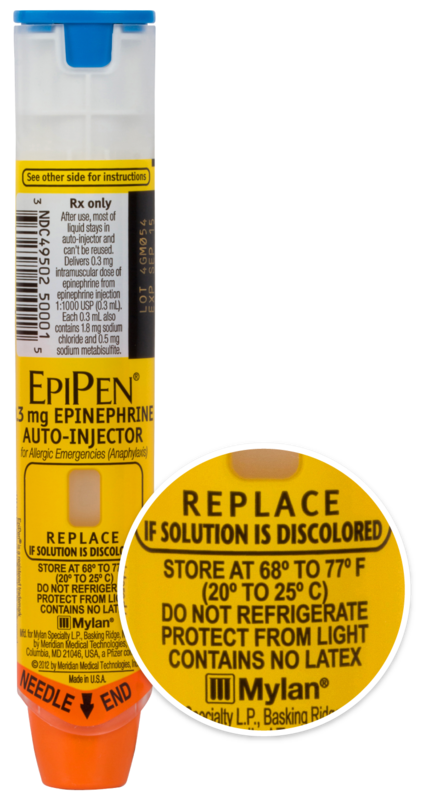 ** EpiPen Auto-Injectors include the following safety instruction: “Store at 68° to 77° F.” The following website says temperature excursions between 59° to 86° F are permitted (and forbids storing EpiPen Auto-Injectors in refrigerators and vehicle glove boxes): https://www.epipen.com/hcp/about-epipen/safety-and-storage. Hot and cold temperatures may damage your EpiPen Auto-Injector. MedShell, Inc. makes no claims or guarantees regarding acceptable temperature excursions. Please contact the manufacturer of EpiPen Auto-Injectors for more information. MedShell is protected by U.S. Patent 9,151,531 and many pending patents. MedShell is a trademark of MedShell, Inc. MedShell was previously known as EpiShell. EpiPen is a registered trademark of Mylan, Inc. MedShell, Inc. is not afﬁliated with Mylan, Inc.